Welcome to the experience economy, where success hinges upon the experiences that organizations deliver. Customers (including consumers, employees, partners or other stakeholders) now determine the strength of their relationship with a company based on the experiences they provide. This new paradigm presents the opportunity for organizations to succeed through experience-based differentiation. North Highland takes an end-to-end, ecosystem approach to design and deploy meaningful interactions across channels – all the while building and embedding lasting CX capabilities. The result? Impactful experiences and CX-optimized organizations that are enabled to design and deliver real, sustainable results. We help clients understand and integrate the ever-changing needs, motivations, and value drivers of their current and future customers in order to grow, adapt and evolve their businesses. This is achieved through deep dives in Customer Research & Insights, Customer Economics, and learning more about the Voice of the Customer. Our team guides organizations through planning, creating and delivering meaningful experiences across channels and touchpoints throughout the customer lifecycle. We offer expertise in Purpose Articulation & Brand Strategy, Go-to-Market Strategy, CX Strategy, Product & Solution Design and Service & Interaction Design. We help our clients become CX-optimized organizations by building capability across people, operations, content, data and systems. We help organizations improve areas that are part of building a customer experience, through CX Organizational Strategy & Design, CX Culture Alignment, CX Talent Growth & Development and CX Capability Development services. North Highland tied for the second highest score in this 2018 report in the Customer Strategy Consulting Use Case and received the seventh highest score in the Complex Customer Experience Implementation Use Case – both use cases positioned 21 worldwide suppliers. Read the full report. We’ve been saying it for years: Customer Experience (CX) must be treated as a transformational organizational objective in order to compete and thrive in the experience economy. The diagnostic and guiding principles that follow are informed by our in-depth experience in helping hundred of clients across numerous industries drive customer-centric change. Our own Rob Sherrell discusses how today's market results suggest that it’s only customer intimacy and the resulting customer-centric organization that offers sustainable competitive advantage. Global CX lead Rob Sherrell speaks at CX Talks, examining what customers will expect and demand and how organizations will have to adapt and evolve. Organizations’ desire to strengthen their connection with employees is pivotal in delivering customer experience and overall business performance. Employee Experience (EX) is the culmination of this paradigm shift. We don’t believe you need to be further convinced that CX is important. We think you need a practical guide for competing and thriving in the Experience Economy, where nothing matters more than the experience you offer. In our latest video, Alex Bombeck, North Highland’s Global Customer Experience Leader, speaks to these ideas and more on optimizing CX strategy. If your firm just gained a new business-to-business customer, a strong focus on performance in the first days or weeks of serving that customer can boost the lifetime value of the relationship. How to maximize customer value and satisfaction in the telecommunications B2B onboarding experience. The evolution from customer experience to human experience challenges businesses to be something more. Rob Sherrell, the global Customer Experience service line leader, explains how companies can move beyond a commercial relationship into a human relationship with customers through 5 key Principles of Human Experience. Individuals today aren’t seeking a job or even a career. Instead they seek experiences from employers that are reciprocal, intentional and inspirational. In this human era, which is ruled by experience, customization, and continual evolution, organizations that fail to focus on Employee Experience do so at their own peril. Hear Chris Osment, Director of Information Technology at Mitsubishi Electric, discuss how North Highland's experts enabled his team to successfully implement a CRM in a strategic manner. See what North Highland can do for you and your business. How does Customer Experience (CX) transformation actually play out in real business scenarios with real people trying to achieve an organization’s objectives? We don’t believe you need to be further convinced that CX is important. We think you need a practical guide for competing and thriving in the Experience Economy, where nothing matters more than the experience you offer. 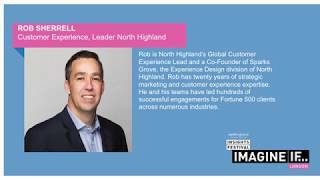 Rob is North Highland’s Global Customer Experience lead. He has over 20 years of strategic marketing and customer experience expertise driving impact for Fortune 500 brands. With an extensive cross-channel CX background, Rob specializes in helping our clients expand their market presence via experience-based differentiation. He and his teams have lead hundreds of successful customer-centered engagements for B2B and B2C clients across industries. Rob is also a founding partner of Sparks Grove, the Experience Design division of North Highland.